Daylight’s End takes the classic end of the world zombie apocalypse and adds in a bit of vampire lore. The sun hurts the undead, and they swarm at night. The world has been overrun, but there are survivors, fighting over what’s left of the world. One of those survivors, Rourke, helps a female scavenger after her group of survivors was ambushed by other scavengers. In return she offers Rourke gas and ammo if she takes her back to her home base. It turns out that home base isn’t as safe as she thought, and the undead aren’t as brainless as they seemed. Rourke agrees to try to help her, and her group of survivors, but of course nothing is ever easy in the apocalypse. At just over an hour and forty minutes long, the movie played to its strengths and didn’t put a lot of filler in. So how does Daylight’s End stack up? It is a very watchable movie, and is true to itself. It isn’t ground breaking, but it is a good movie, and earns a 71/100. If you haven’t seen it, add it to your list and let me know what you think. Is I Am Legend a zombie movie? There is a virus that turns people into hungry animals that eat other humans. That qualifies as a zombie flick in my book. I Am Legend is one of those movies I usually end up watching about once a year. So why am a giving it an 80/100? The main reason is that they never made a sequel. I feel like this world deserved a sequel, or better yet, a survival story taking place when the infection first started. Will Smith plays Robert Neville, and his slow crawl into the edges of madness so amazingly well. The movie hits you in the guts at times, but also delivers on the action and the horror of what a post apocalyptic world would be like. If you haven’t seen I Am Legend in a while, or somehow missed it, you need to go watch it right now. The world has been overrun by the undead, but a small military base has taken in a small group of survivors. Day of the Dead: Bloodline has a couple subplots, but its basically about a stalker turned zombie, turned stalker still. All the classic horror movie tropes are included. The vents are big enough and strong enough to support crawling about in, security is incredibly tight, but falls apart in a heartbeat. Oh, and the zombies are getting smart, or at least some of them are. If the movie started at the hour mark and was just the last thirty minutes I would have ranked it higher. I want hordes of zombies when I watch a zombie movie, not a single zombie stalker hunting the main character. Which is why I’m giving Day of the Dead: Bloodline a 51/100. It was watchable, but it’s not a movie I’d watch twice, if that makes any sense. 28 Weeks Later takes place 6 months after England has been overrun by the undead in 28 Days Later. The zombies have begun to deteriorate and with the help of US soldiers, parts of London are being taken back. If you pay attention, the whole plot is foreshadowed in the first few minutes of the movie. The beginning is the end and vice versa. So how does 28 Weeks Later stack up against its predecessor? It ranks a solid 80/100, and is well worth watching. Some of the magic from the first movie is gone, but there are also a few scenes that other movies can only hope to get close to. The evacuation shelter scene is something every other zombie movie hopes to achieve. 28 Days Later is the original “Fast” zombie movie. Jim wakes up in the hospital but something is wrong, there are no staff or patients around. Him wanders outside to find that London looks deserted. At least until Jim make his way into a church, and discovers where everyone went. 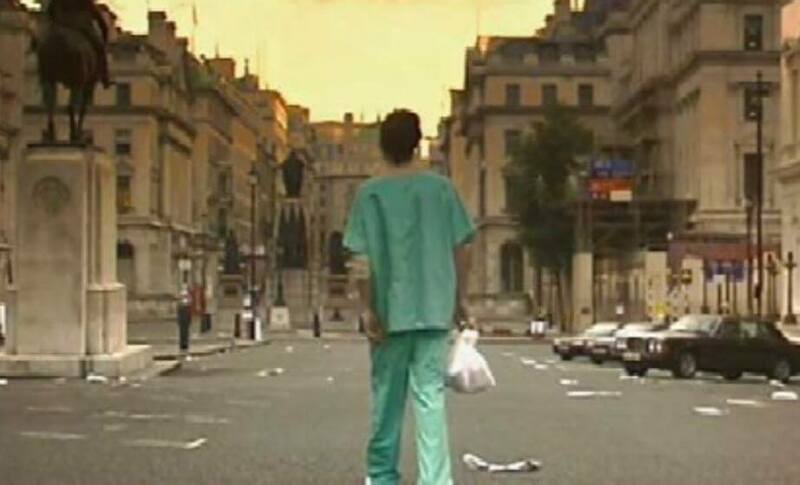 If you somehow missed 28 Days Later, you need to watch it now. It is a solid 100/100.